Today, I am writing a different kind of post. I mentioned it in a previous post: I bought myself a kitchen machine. I am now the proud owner of a Bosch MAXXIMUM Kitchen Machine. His name is Mephisto. Yeah, I got really sick of kneading all that gluten-free dough, so I began inquiries. Now, it’s really difficult to wade through that jungle that is the offers on the kitchen machine marketing. Which is why I decided to write this post. There’s Kitchen Aid, of course. I originally started out wanting one of those, but someone who worked in customer service said that they may look pretty, heavy and sturdy, but that they used to come back all the time. My heart really broke, because they are just so pretty and basically the symbol of fun and elegance in the kitchen. But, I kept an open mind and at least considered buying from a different brand. I began my research. I read product reviews on testing websites, customer reviews on amazon and other online stores, I began looking at videos on YouTube. And I realized: if you are looking into buying a kitchen machine as someone who is looking to work on gluten-free dough, then you’re kind of own your own. There hardly is any advice out there that caters to the special needs of the sticky and tough monster that is gluten-free dough. I thought that I could review kitchen machines here on my blog, and I wrote to several manufacturers, but sadly none of them were interested even though I explained that the gluten-free market is still largely untapped, and that many celiacs would be very responsive to being marketed to. 1. 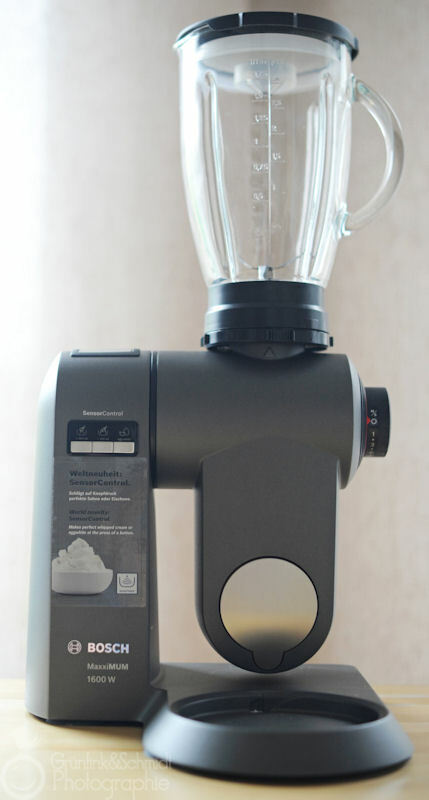 Why do you need a kitchen machine? 2. Know what other actions your machine should be able to carry out that you will (realistically) make use of. 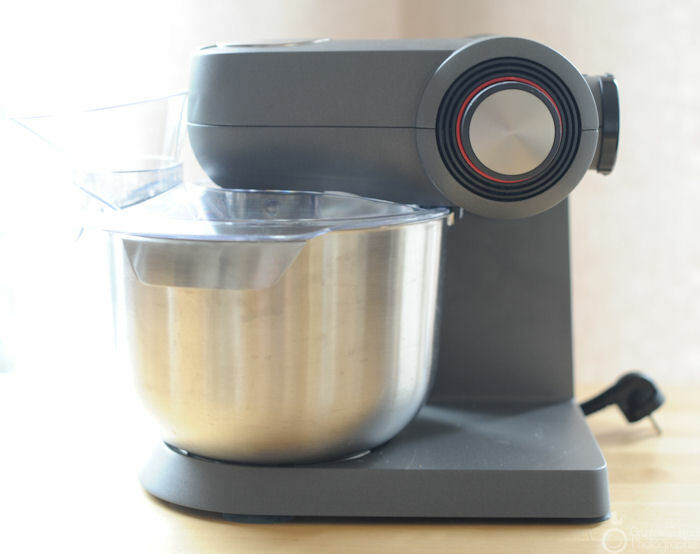 I wanted a sturdy machine which would knead large amounts of gluten-free bread dough and with a long life expectancy.This meant that I wanted a machine that would not as much as move while kneading a kilo or two of flour plus other ingredients. I wanted a machine that would include options for shredding vegetables, grinding nuts or other things, maybe even a pasta machine. I wanted to make smoothies. I wanted these options to be easy and comfortable to work with. I already have a mill and make my own flour, so this skill was irrelevant for me. I also have always wanted a machine that kneads dough from above rather than from below. It was also supposed to be somewhat pretty. Just a little, but pretty enough. I found that perusing the internet only brought me so far, because whatever I was looking for, I was unable to find – or so I thought. 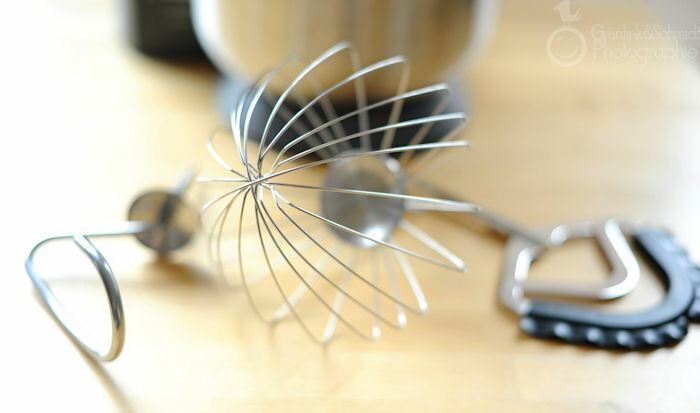 Kitchen Aid – yeah, not really. But at this point I was still convinced that there was no alternative. 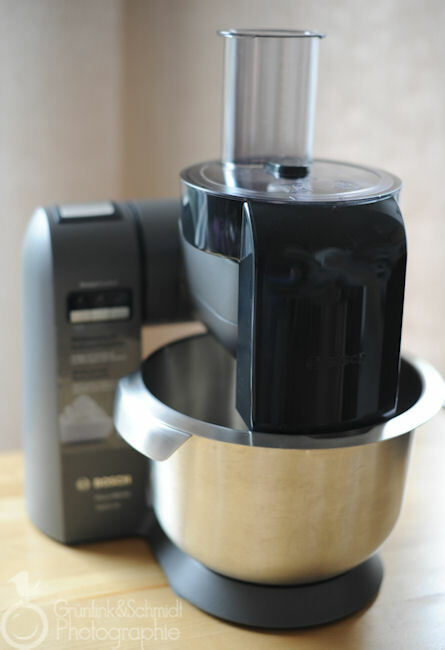 I never considered buying a Kenwood or a machine that would be able to cook, too, such as the ThermoMix. 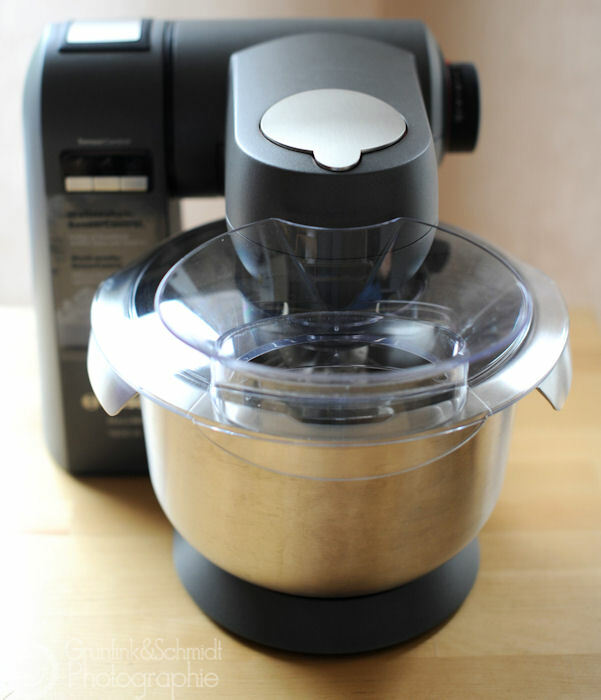 The videos I watched of Kenwood didn’t really convince me and I am way too much of a cook-at-the-stove kind of person, and something about the ThermoMix, I can’t put a finger on it, maybe it’s all that plastic, just doesn’t get me excited. Your needs are going to be very different than mine. And I strongly suggest you differentiate between a craving and real, realistic needs! I asked around and found that it didn’t make a lot of sense to do so, because everyone has different needs and expectations. I found that speaking with people who own a Kitchen Aid or a ThermoMix was like speaking to people who own Apple products or are members of a cult. It’s not helpful at all, because they are completely convinced of their tool and unable to see any flaws in it and thus whatever they tell you about their tool is not likely to give you a proper idea of what you are to expect. 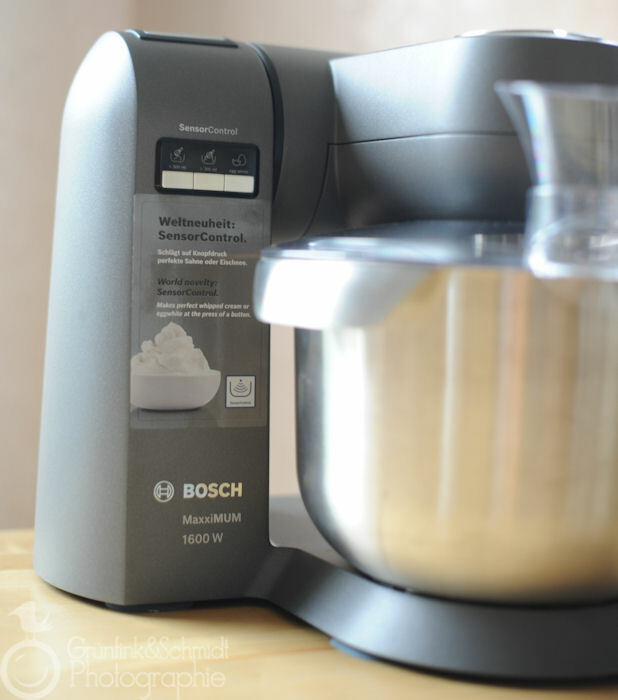 Nonetheless, there were some people in the threads I opened in the German celiac forum, who had all sorts of different machines, for example from Swedish manufacturer Ankarsum and people who pointed me to the upper-class machines manufactured by Bosch. Asking around helped me find more options and made me do a much better research, and it’s how I first learnt of the Bosch MAXXIMUM’s existence. I then began watching videos on YouTube. There are tons. This one, comparing the kneading ability of the Kitchen Aid and my favourite machine, the Krups KA 990t, was key in throwing me off Kitchen Aid. I have since watched a test aired on German television, where the issue of the lump of dough sticking to the hook of the Kitchen Aid, is confirmed. It was through videos, that I first came to consider buying a Bosch. 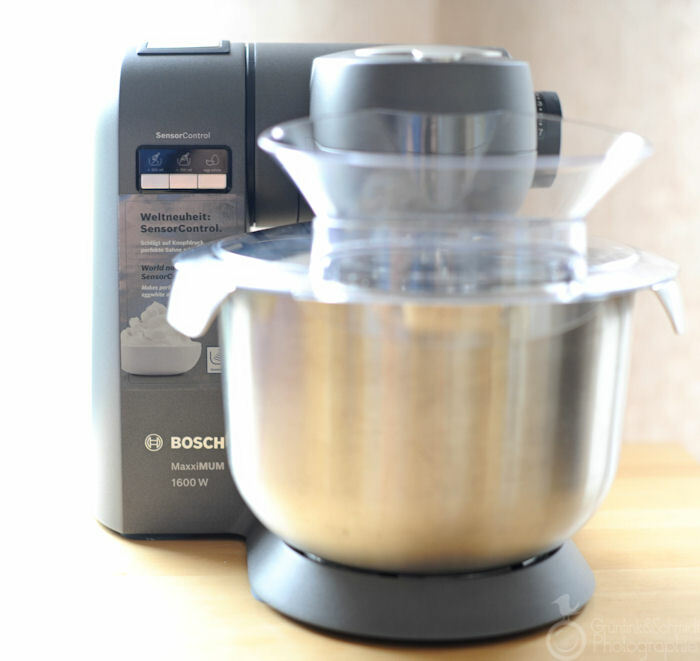 I saw a ton of videos with the MUM6N21 (also known as the Bosch Universal Plus Mixer), which really convinced me. For a really long time thereafter I thought this would be the machine I would end up getting. To be honest, if I didn’t end up finding a way of paying for a MAXXIMUM, I would have just bought this one. It is sturdy as a rock, it is able to knead large amount of doughs, you can shred vegetables, make pasta (there are metal plates that you can use in combination with a masticator), there is an attachment for smoothies. It’s just not very pretty, and you have to reach into your dough to get out the hooks. I eventually read a thread on the internet where several people said this really put them off and took away from their joy of using this machine, so I reconsidered and decided to save my money and to buy a machine that would be more expensive, but which I would absolutely love and actually use, because it was comfortable to do so. 4. Look, touch and feel. When buying a kitchen machine, it is absolutely imperial that you see it live and in colour prior to making your purchase. Videos and pictures distributed by the manufacturer are good to give you a basic idea of your new kitchen machine, but they will not actually reflect the colour of it as seen in real light, they won’t show you that it rattles and jumps across your kitchen counter while in use. Plus, you can get a pretty good idea of size and how each individual machine is handled once you actually touch it at the store. I cannot tell you how many stores I ended up visiting, but I went to all the larger department and electronics stores here in Cologne, a store specialized on kitchen instruments (where I also saw Teddy kitchen machines by Kitchen One, made in Denmark). Whenever I was out of town and running around in a city centre that was not Cologne, I would make a point to stop by the kitchen machines. It was during one of these visits, when I was walking around Frankfurt with my mom, that I first saw the Bosch MAXXIMUM and fell in love. It was exactly the type of machine I had been looking for. My mom loved it, too. It is entirely made out of metall on the outside, all the areas where you insert hooks and gadgets are also made of metall and it’s a heavy machine, very sturdy. I checked out the Bosch website, and looked into the different gadgets, and I found that they satisfied my criteria. I suggest waiting for a while, before you make your purchase. Do some more research. Visit the website of your kitchen machine’s manufacturer. Get giddy. Read some more, make a point to read negative reviews, if you can find them. Know what you will expect and whether you can live with the flaws mentioned in the reviews. Watch other offers pop up, check those out while keeping an open mind. Stay flexible. I am glad I waited with my purchase (or rather: that I had to wait), because I ended up paying just half of what I would have payed otherwise, simply because there happened to be an offer in a store here in Cologne. This amazing offer was not available online and I heard it from a friend who in turn heard it from someone else. I doubt I will ever come across such a good offer ever again, the price was absolutely excellent! What I am trying to say: if this can happen for me, it can happen for any other kitchen machine, if you keep your eyes peeled. I now have the Bosch MAXXIMUM. Here are some more pictures of Mephisto. I love it! The SensorControl allows you to beat egg whites and whipping cream with just the press of a button. It knows when to finish. Amazing! Here it is from a different perspective. 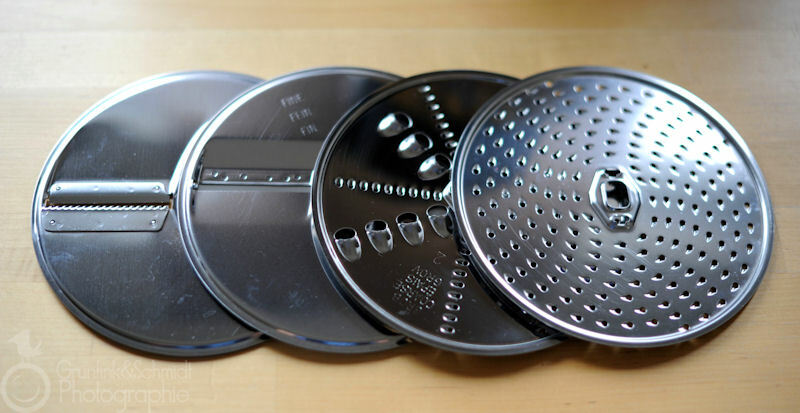 Here are the different hooks which you can use for different types of dough. Including a big glass container for making smoothies and cocktails, for pureering soup or crushing ice. I also have a veggie shredder. Very practical. Anyway, I hope you found my suggestions on how to go about buying a kitchen machine for your gluten-free kitchen helpful. Pingback: Gluten-free Anise Clouds | Vegetarian - and gluten-free!